Dr. Fei-Fei Liu is the Chief of the Radiation Medicine Program and Department of Radiation Oncology at the Princess Margaret Cancer Centre, and also Professor and Chair of the Department of Radiation Oncology at the University of Toronto. She is also a Senior Scientist at the Ontario Cancer Institute, and holds the University of Toronto/Princess Margaret Cancer Centre Dr. Mariano Elia Endowed Chair in Head & Neck Cancer Research. Her research program is focused on investigating and developing novel molecular therapeutic strategies for human malignancies, delivered in conjunction with radiation therapy, along with investigating molecular aberrancies for several human cancers including breast, cervix, and head/neck cancers. Dr. Liu has >150 peer-reviewed publications on these topics, and has filed three patents. 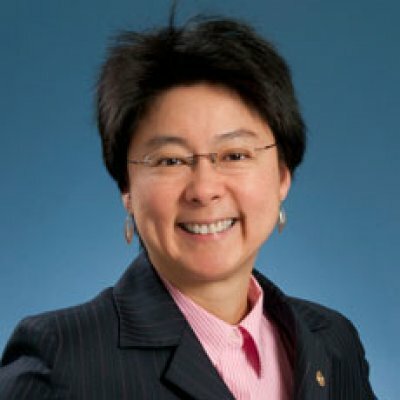 She currently holds >$2.5M of peer-reviewed research funding (as principal investigator, co-PI or co-investigator) from agencies including the Canadian Institutes of Health Research (CIHR), the Canadian Cancer Society Research Institute (CCSRI), and the Ontario Institute for Cancer Research (OICR). She was also the former Director of a $1.9M CIHR/Terry Fox Foundation Research Training Initiative, entitled “Excellence in Radiation Research for the 21st Century (EIRR21)”, with the objective to train the next generation of trans-disciplinary scientists in Radiation Medicine. Weekend to End Women's Cancers Toronto, ON. Overexpression of BMI1 correlates with cancer development, progression, and therapy failure; however, the underlying molecular mechanisms remain to be fully elucidated. Using the C666-1 nasopharyngeal cancer (NPC) model, the role of BMI1 in mediating response of NPC cells to radiation therapy (RT) was investigated. The results showed a novel radioresistance function for BMI1 in NPC, wherein BMI1 depletion sensitized NPC cells to RT. Cell cycle analysis and transmission electron microscopy (TEM) showed apoptosis as the major mode of cell death, and the mitochondria as a primary targeted cellular organelle. Genome-wide microarray and pathway analyses revealed that the P53 pathway is a critical mediator of this process. Cotransfection with siP53 rescued C666-1 cells from cytotoxicity upon BMI1 depletion and RT, thereby corroborating the role for P53. Pretreatment with the antioxidant, Trolox, inhibited apoptosis, indicating that production of reactive oxygen species (ROS) is also mediating cytotoxicity. In vivo, BMI1 depletion combined with RT abrogated tumor-forming capacity in SCID mice, showing the relevance of this process in a more complex tumor environment. Hence, we show a novel role for BMI1 in conferring radioresistance in cancer cells through the downregulation of p53-mediated apoptosis. These results suggest a potential strategy of BMI1 depletion combined with RT for tumors wherein BMI1 appears to be driving disease progression. Global micro-RNA (miR) profiling of human malignancies is increasingly performed, but to date, the majority of such analyses have used frozen tissues. However, formalin fixation is the standard and routine histological practice for optimal preservation of cellular morphology. To determine whether miR analysis of formalin-fixed tissues is feasible, quantitative real-time PCR (qRT-PCR) profiling of miR expression in 40 archival formalin-fixed paraffin-embedded (FFPE) breast lumpectomy specimens were performed. Taqman Low Density Arrays (TLDAs) were used to assess the expression level of 365 miRs in 34 invasive ductal carcinomas and in 6 normal comparators derived from reduction mammoplasties. Its technical reproducibility was high, with intra-sample correlations above 0.9 and with 92.8% accuracy in differential expression comparisons, indicating such global profiling studies to be technically and biologically robust. The TLDA data were confirmed using conventional single-well qRT-PCR analysis, showing a strong and statistically significant concordance between these two methods. Paired frozen and FFPE breast cancer samples from the same patients showed a similar level of robust correlation of at least 0.94. Compared with normal breast samples, a panel of miRs was consistently dysregulated in breast cancer, including earlier-reported breast cancer-related miRs, such as upregulated miR-21, miR-155, miR-191, and miR-196a, and downregulated miR-125b and miR-221. Additional novel miR sequences of potential biological relevance were also uncovered. These results show the validity and utility of conducting global miR profiling using FFPE samples, thereby offering enormous opportunities to evaluate archival banks of such materials, linked to clinical databases, to rapidly acquire greater insight into the clinically relevant role for miRs in human malignancies. A significant proportion of oropharyngeal squamous cell carcinomas (OSCC) are associated with the human papilloma virus (HPV), particularly HPV16. The optimal method for HPV determination on archival materials however, remains unclear. We compared a quantitative real-time polymerase chain reaction (qRT-PCR) assay for HPV16 mRNA to a DNA in situ hybridization (ISH) method, and evaluated their significance for overall (OS) and disease-free (DFS) survival. Head and neck cancer (HNC) is the eighth most common malignancy worldwide, comprising a diverse group of cancers affecting the head and neck region. Despite advances in therapeutic options over the last few decades, treatment toxicities and overall clinical outcomes have remained disappointing, thereby underscoring a need to develop novel therapeutic approaches in HNC treatment. Uroporphyrinogen decarboxylase (UROD), a key regulator of heme biosynthesis, was identified from an RNA interference-based high-throughput screen as a tumor-selective radiosensitizing target for HNC. UROD knockdown plus radiation induced caspase-mediated apoptosis and cell cycle arrest in HNC cells in vitro and suppressed the in vivo tumor-forming capacity of HNC cells, as well as delayed the growth of established tumor xenografts in mice. This radiosensitization appeared to be mediated by alterations in iron homeostasis and increased production of reactive oxygen species, resulting in enhanced tumor oxidative stress. Moreover, UROD was significantly overexpressed in HNC patient biopsies. Lower preradiation UROD mRNA expression correlated with improved disease-free survival, suggesting that UROD could potentially be used to predict radiation response. UROD down-regulation also radiosensitized several different models of human cancer, as well as sensitized tumors to chemotherapeutic agents, including 5-fluorouracil, cisplatin, and paclitaxel. Thus, our study has revealed UROD as a potent tumor-selective sensitizer for both radiation and chemotherapy, with potential relevance to many human malignancies. Deregulation of miRNAs is associated with almost all human malignancies. Human papillomavirus (HPV)-associated oropharyngeal carcinoma (OPC) has a significantly more favorable outcome compared with HPV-negative OPCs; however, the underlying mechanisms are not well understood. Hence, the objectives of this study were to determine whether miRNA expression differed as a function of HPV status and to assess whether such miRNAs provide prognostic value beyond HPV status.